After the first round at the Las Vegas Challenge, one that lived up to its name for Paige Pierce, she found herself eight strokes out of the lead and tied for 8th place with 16 competitors between her and first place. After a scorching second round that moved her all the way up to second place, and a third round the put her tied with Catrina Allen for the lead, Pierce brought home the win in the final stages of yesterday’s fourth round. It is the second season in a row she has won the opening PDGA National Tour Series event in Las Vegas. Pierce finished the final round with the hot score, 2-under par 59, which brought her four-round winning total to 2-over par 244. Catrina Allen and Sarah Hokom finished tied in second place after Hokom’s 1-under par 60 and Allen’s 1-over par 62 brought their totals to 5-over par 247. Jennifer Allen rounded out the top four after a 1-over par 62 final round took her total to 8-over par 250. Early on in the final round, it was Catrina Allen who looked to have the advantage, playing clean golf and carding three birdies on the front nine despite also missing three circle 1 putts. Pierce, on the other hand, found some adversity. After two early birdies, she went out-of-bounds on holes 4 and 5 resulting in back-to-back bogeys. She caught up as the round went on, parking the 543-foot par 4 9th for birdie and cashing in a 60-foot putt for another on the 496-foot par 3 12th. But Pierce again found trouble, going out-of-bounds twice on the 555-foot par 4 14th. She was able to limit the damage though, by hitting a 50-foot bogey-saving putt, while Catrina Allen came away with a par after a missed putt from circle 1. That easy tap-in birdie and Catrina Allen’s par tied the pair at 2-over par with just three holes left. Matching pars on hole 16 maintained the tie, but the deadlock didn’t last much longer. On the 507-foot par 5 17th, Catrina Allen’s drive landed under a bush right of the fairway, causing her to take an awkward stance on her next shot, which went out-of-bounds as she tried to scramble to the green and save a bogey four. After she was forced to lay up for a double-bogey five, and Hokom finished out the hole with a bogey, Pierce, who pared, had a two- and three-stroke advantage over her closest competition with one hole left to play. Catrina Allen pushed to make up the deficit on her approach to the green on the final hole after Pierce was in position for an easy par, but her shot finished too far right and out-of-bounds. From there Pierce layed up under the basket for her the win. Hokom kept herself in contention throughout the event by playing simple, manageable shots off the tee to allow for easier approaches to the difficult greens at the three Wildhorse Golf Club courses. Her strategy ultimately paid off as she tied Allen for second place. Further down the lead leaderboard, Lisa Fajkus finished fifth at 10-over par 252, followed by Kona Panis in sixth at 12-over par 254. 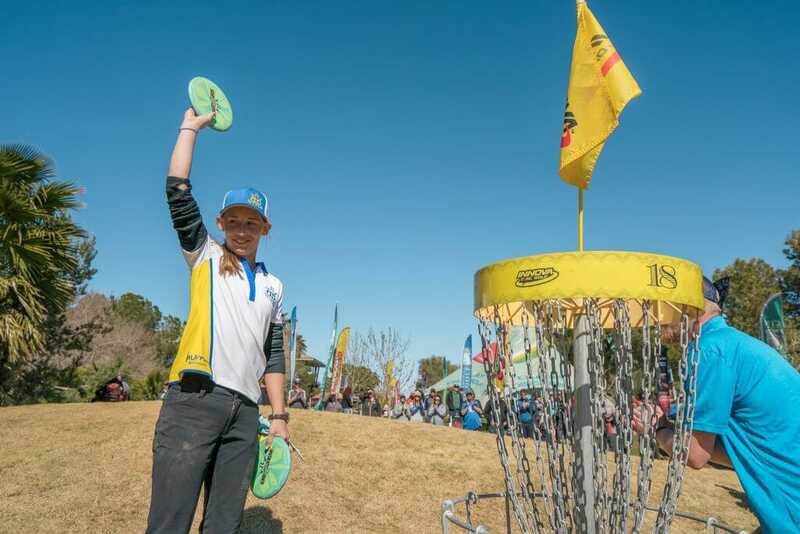 Madison Walker finished tied in eighth place at 15-over par 257 in her first event since the 2017 PDGA Professional World Championship after recovering from a wrist injury she suffered early last season. Pierce has a chance for back-to-back wins in quick succession as the tour heads south to Scottsdale, Arizona for the Memorial Championship, which begins Wednesday. 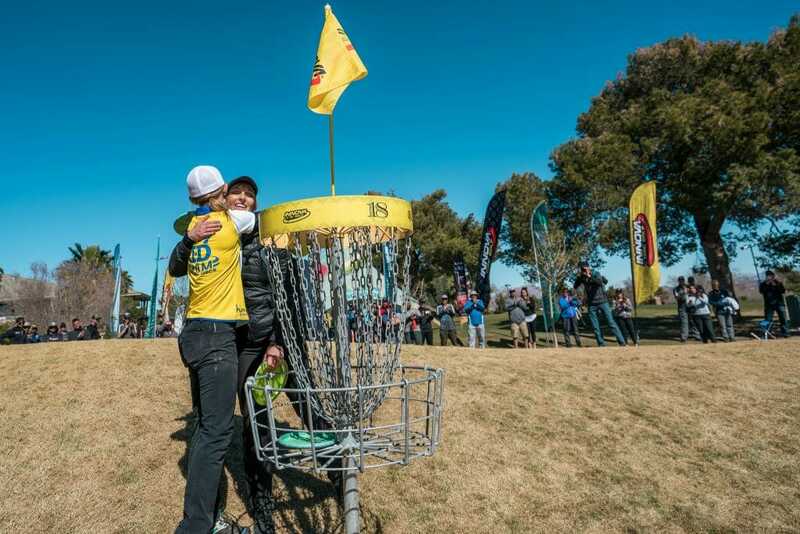 If Pierce can get the victory in the first Disc Golf Pro Tour event of the season, it will be the second year in a row she has started her season by winning the opening event of both the PDGA National Tour and DGPT. Comments on "Pierce Completes Comeback Las Vegas Challenge Win"